What Makes My Inspection & Radon Services Different? Most inspectors still use a clipboard and a pencil. I don’t even have these things. Most inspectors charge for working on weekends & holidays. I do not. Most inspectors will get the report to you in a few days. Mine is provided to you same day. who has this kind of technology. that other inspectors will not, and can not see. My average is about 3 hours. Why is that? Most inspectors are in a hurry to get to their next house, and they try to squeeze in 3 or 4 inspections per day in order to maximize their income. I focus on only 2 house per day. (My insurance only allows this). Your house will get the most thorough, best possible inspection from OxBow. Most inspectors do not conduct inspections for Mold, Termites, Lead Paint, or Radon Gas. I believe that every home should be tested for these things. So does the Environmental Protection Agency. Therefore. Take Lead Paint for example. Lead Paint is a hazard to all humans and to our pets, yet it exists in millions of homes. I will run a test of the paint, both inside and outside the home, at several varying strategic places. These tests will immediately identify the presence of lead-based paint. I do this for every home built prior to 1980, since most lead-based paints were banned by the EPA in 1978. Now, let’s talk about Radon Gas. Radon is the second leading cause of lung cancer in these United States, and amazingly, very, very few inspectors even test for it! Even fewer Inspectors are even qualified to do it! Radon Gas kills about 22,000 people annually (killing almost 5,000 Americans per year more than drunk drivers kill!). Every home has some level of radon. The few inspectors who do conduct radon tests use charcoal canisters that are not terribly accurate, but they are terribly inexpensive. I have purchased the very latest device in home Radon Gas detection. It is extremely high-end electronic technology costing several thousand dollars. It is much like the radiation detection devices used by the US military, and it can very, very accurately detect the presence of Radon Gas (and also of thoron gas) in as little as 20 minutes. I run a minimum of 6 separate gas detection tests and then compare the results against one another. Idaho has moderate levels of Radon Gas throughout the state, but Boise and Valley counties are amongst the highest in the nation. High levels of Radon Gas in a home can be easily controlled and is generally not expensive. The key is: knowing what your Radon Gas levels really are. 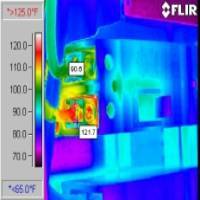 Notice the hot breaker shown in red.This breaker is generating excess heat due to high resistance and will likely fail soon. Notice the purple stain just to the right of the bottom round window. This is mold and water damage inside the wall, caused by a leaking washing machine drain. When termites invade buildings, the normal heat patterns of the walls, floors and roof are changed due to the presence of termites. The thermal imaging camera records this change in heat pattern and indicates the exact location of any termite infestation. A color image shows hot spots as red or yellow and cold spots as blue or purple. These heat patterns indicate termite infestation. A small leak around this door that had remained unseen for quite some time has caused progressive water damage and mold underneath the linoleum and floor tiles. A bathroom window that is improperly sealed leaks moisture into the inside of the wall. Over time, this moisture damages the structural beams of the wall itself, and creates molds which multiply within the walls. The contractor and sub-contractors who built this home either got into too much of a hurry, or they just made an honest mistake. Either way, the heat (energy) loss through this portion of the wall is quite severe, and causes the room to be too hot in the summer and unnaturally cold in the winter.